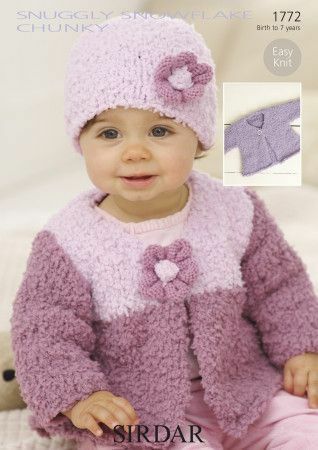 Two variations of Cardigan and a Hat knitted in Snuggly Snowflake Chunky. Pattern shown in Main Shade (637) and Contrast Shade (636). You will require 1 Pair of 5 1/2mm (UK5) Knitting Needles and 1 x Press Fastener. Pattern shown in Shade (636). You will require 1 Pair of 5 1/2mm (UK5) Knitting Needles and 1 x Press Fastener. Pattern shown in Shade (254). You will require 1 Pair of 4mm (UK8) Knitting Needles.